2016-06-05 This weekend my wife and I went to the Saint Paul, MN area by way of Devils Lake State Park in central Wisconsin for the graduation of our granddaughter from high school. I very much enjoyed using the Yaesu 857d and Little Tarheel antenna both going and coming on the trip. I made a number of contacts on both 40 and 20 meters and got excellent reports on both signal strength and audio quality almost every time. This is simply a clean, effective installation that has worked without any significant problems now for going on two years. In fact the only problem has been with the Little Tarheel control line connector. I occasionally have to pull it apart and re-plug several times to get the contacts to work. It is on the rear of the car and though is "sealed" still is exposed to the winter salt spray from the roads and other weather related abuses. But so far that has always fixed it. Needless to say I am very pleased with the entire installation. For many years I had an HF/VHF mobile installation in my 2005 Pontiac Grand AM. It was a lot of fun, especially on long trips. Some of my best DX (I'm not a DX hunter) were with that mobile rig. But when we sold another car and got the Hyundai Sonata I just couldn't bring myself to install it in that new car. One reason was that I had so much trouble getting a good antenna installation on the Pontiac that I ended up drilling a hole in the trunk lid. That solved my problems but was too extreme for a new car! 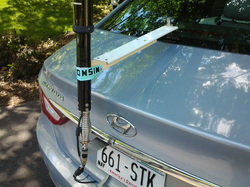 But at breakfast yesterday with a couple other hams in the neighborhood Jerry (N9AC) mentioned that he had a lot of mobile antenna mounting hardware including a license plate mount. That struck a nerve as I had pretty much already concluded that something involving the license plate holes was my only feasible approach. So I got it from him and was off on another mobile adventure. My rig is a Yaesu FT857D. I like it mobile as it is small, you can remote the head and I'd had good luck with it for years - and it was in the box just waiting to be used! My antenna is a "Little Tarheel" screwdriver antenna. Once again, I had it and it has served me very well previously also. The guys at breakfast said modern cars have more current capacity in the auxiliary jacks than older models, probably at least ten amps. That potentially addressed another major issue that was holding me back. I had strung battery wires in two previous cars and besides NOT being fond of that, I could not find an easy way to get from the engine compartment into the passenger compartment on this Sonata. Everything is battened up tightly. So I mounted the radio under that passenger seat. I put the control head on the column below the current radio and air conditioner/heater controls and managed to come up with a mechanism to mount the antenna. I grounded the radio to one of the seat bolts, the antenna mount to the trunk lid via a ground strap which in turn I grounded to the body with another strap and after fussing with it finally managed to get the antenna control wires and feedline routed from inside the trunk to the radio and antenna rocker switch. I also put a mag mount 144/440 antenna on the roof. The good news is that I cannot detect any car generated noise in the receiver on any frequency whether idling or driving. The other good news is that I could not find any indication that the car is unhappy with the radio on any frequency. The maximum power I've used so far is 60 watts. More good news is that at 60 watts setting (not actually measured) I am showing only around five amps current. The final good news is that 1) I had several VHF QSOs with it both direct and through a repeater nearby and 2) I had two 40 meter QSO's with K8HLJ net control for MidCars located near Cincinnati, Ohio. I had several 40 meter QSOs with my neighbor just a few blocks away and he heard no indication of engine/car generated noise or anything. So, I'm HF/VHF mobile again! 12/10/14: Well, I'm off HF mobile for a bit. I left the stinger on the Little Tarheel when I drove into the garage and when the door went down it bent it nearly double. I ordered a new one, the 56 inch one. The one I bent double was about 39 inches long. After using the longer one, which tuned up very well on 80 through 6m I began to notice that I have a ground or other connection problem. The signal cuts out, like an almost good connection when I go round corners, hit bumps, etc. It's too cold now to fiddle with it. Also I must have gotten a surge in the power system in the car when starting it as the FT-857d all of a sudden began acting strange. I think it is back to normal now but I had to do a full hard reset and lost everything in memory. Haven't taken time to reprogram it so I just use it on a local vhf frequency for now. Again, it is too cold to remove the transceiver, bring it inside and upload all the settings to it. Spring is coming! 2/13/15 Finally got around to running some more tests. Turns out that the voltage at the accessory jack drops to about 11v or lower when I key the transmitter! That is below spec for the radio and probably explains the radio acting funny. I'm puzzled that I've been using it happily for a number of months without noticing this. So still a bit suspicious. But I decided to pull the radio from the car and while at it remove the Tarheel antenna. That led to the clear discovery of why the signal was cutting out. The PL259 connector was loose at the bottom of the antenna! I've been at this for many years and know that most problems are simple.... But somehow it never occurred to me to check that connector! Good to be humbled now and then! As for the radio, I plan to set it up and use it in the shack for a while to see if anything funny happens there. 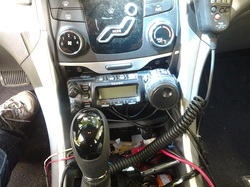 Then when I return it to the car I'll run heavy cables from the battery to the radio - like I should have done initially.